Oklahoma Connection | Durrett came to Oklahoma City, Oklahoma, with his family in 1930. William Durrett developed his work ethic as a young boy in northwest Oklahoma City, where he delivered newspapers and was the top magazine subscription salesman as a student at Classen High School. 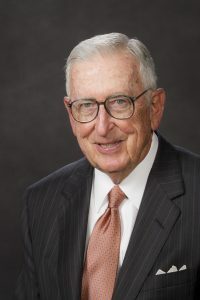 William E. Durrett received a BS degree in business from The University of Oklahoma in 1952 and served as Finance Officer in the U.S. Air Force from 1952 to 1954. Durrett began his career in the insurance industry with C. W. Cameron, joining the Southwest Division of North American Accident and Health Insurance Company in 1954, which later became American Fidelity. He served in various officer positions, including president/CEO of American Fidelity Corporation from 1977 to 1992 and chairman from 1989 to 1997. He currently serves as senior chairman of American Fidelity Corporation and chairman of INSURICA, Inc. During his tenure of leadership, the company grew dramatically with assets currently exceeding $8.3 billion. An active leader in professional, civic and cultural organizations, Durrett served as president or director of thirty-one business entities including chairman of INTEGRIS Health and the Oklahoma City Chamber of Commerce and currently serves as a director of the following: Oklahoma City Chamber of Commerce, Oklahoma Medical Research Foundation and the Oklahoma State Fair. Durrett previously served on the boards of the American Council of Life Insurers, BancOklahoma Financial Corp., Health Insurance Association of America, INTEGRIS Health, Oklahoma Gas and Electric Company, Oklahoma Symphony Orchestra and the United Way of Greater Oklahoma City, among many others. Durrett was honored with the Pathmaker Award from the Oklahoma City/County Historical Society in 1997 and was inducted into the Oklahoma Hall of Fame in 2004 and the Oklahoma Commerce and Industry Hall of Honor in 2015.